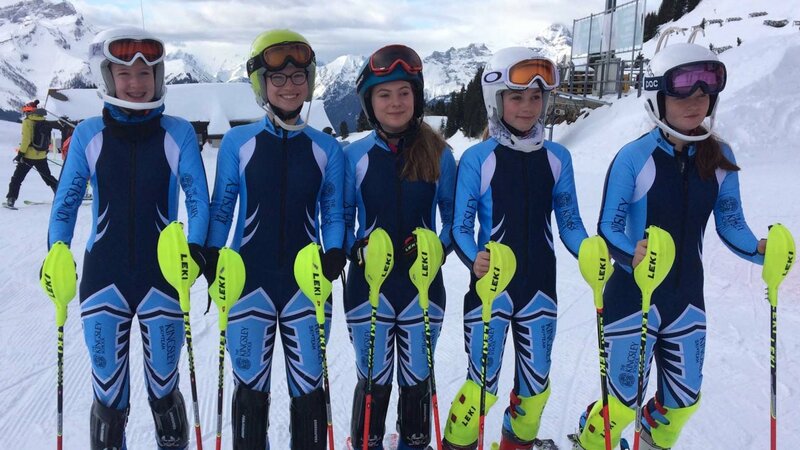 Five Year 9 pupils have recently returned from competing against international opponents in the Aiglon College Ski Cup in Switzerland, where Hannah Dennison (14, from Daventry) and Emma Lawton (13, from Leamington Spa) finished in first and second place. The Kingsley School squad have already been successful on dry slopes in the UK, finishing 4th in the U14 English Schools’ Championships and 9th in The British Schools’ Championships in 2017, but the high profile international competition at Villars-sur-Ollon was their first time competing in an alpine environment. Hannah and Emma, who have recently returned from the English Schools’ training camp in Norway, finished above competing skiers who live and train in alpine conditions. Cecilia Goldwin (14, from Leamington Spa), Lucy Sainsbury (13, from Stratford-upon-Avon) and Lorenza Chapman (14, from Leamington Spa), all of whom had no previous experience on snow, finished above half way in the rankings. 23 skiers also finished competing in the Midland Schools Ski Championships on Sunday 18th March with further podium finishes for all teams, confirming The Kingsley School’s status as the top skiing school in The Midlands. Holly Austin (16, from Stratford-upon-Avon), finished first and Millie Hatton (17, from Warwick) second in the U19 event; Hannah Phillips (15, from Banbury) third in the U16 category; Hannah Dennison, Emma Lawton and Lucy Sainsbury first, second and third respectively in the U14 category; and Claudia Creswell (10, from Warwick), third in the U12 category.